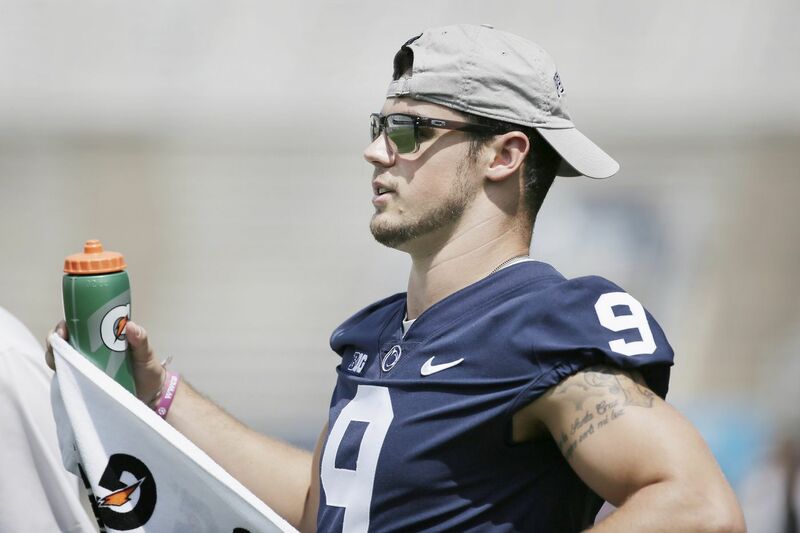 Trace McSorley and his Penn State teammates get a top-10 preseason ranking. Penn State came in at No. 10 in the Associated Press preseason Top 25 poll, which was released Monday. Defending national champion Alabama was voted No. 1, receiving 42 of the 61 first-place votes cast by members of the media. Clemson picked up 18 first-place votes and was ranked second. The Nittany Lions, who were ranked eighth at the end of last season, after finishing with an 11-2 record and a victory in the Fiesta Bowl, were one of four Big Ten East Division teams, and five Big Ten Conference teams overall, ranked in the top 14. Wisconsin, which received one first-place vote, was ranked No. 4, one rung ahead of Ohio State. Michigan State finished just behind Penn State at 11th, with Michigan coming in 14th. The Nittany Lions will play all four teams this season. Penn State lost some talented players from last season. Running back Saquon Barkley, wide receiver DaeSean Hamilton, and tight end Mike Gesicki were three of their most productive offensive players. The defense lost eight starters, and the team needs to find a kicker in training camp. But the Lions bring back quarterback Trace McSorley, a Heisman Trophy candidate who enters the season holding or sharing 15 program records. The offensive line is considered a strength, and the defensive backfield returns John Reid (St. Joseph's Prep), who started in 2016 but sat out last season with a knee injury, and all-Big Ten second-team cornerback Amani Oruwariye. The Lions will open their season Sept. 1 against Appalachian State at Beaver Stadium. Georgia, which lost to Alabama in overtime in last year's national championship game, was ranked third. Washington, which was defeated by Penn State in the Fiesta Bowl, was sixth, followed by Oklahoma, Miami, and Auburn, which finished one point ahead of the Nittany Lions. Coming in after Michigan State was No. 12 Notre Dame and No. 13 Stanford. Southern California was ranked 15th, with Texas Christian and West Virginia right behind. Mississippi State, with a new head coach in former Penn State offensive coordinator Joe Moorhead, came in 18th. Florida State and Virginia Tech were next, with the bottom five spots filled by Central Florida, Boise State, Texas, Oregon,and Louisiana State. Four matchups of ranked teams are set for Labor Day weekend. On Sept. 1, Washington will meet Auburn in Atlanta, and Michigan will play at Notre Dame. Miami will take on LSU at AT&T Stadium in Arlington, Texas, on Sept. 2, and Virginia Tech will be at Florida State the next day.